→Ryobi p236 review: Is It The Impact Wrench For You? Ryobi p236 review: Is It The Impact Wrench For You? Some of my home projects require me to complete tasks that involve bolting and drilling of holes. When I used to rely on a hammer drill, I had to put in more effort, which would mean doing less work. I had to find a powerful tool that will get all my work done with little input (time and effort). Ryobi p236 is a beast whose design features a torque that will address all your drilling needs. You can also use it on ¼ hex bolts. Check out our Ryobi p236 review. An impact driver is used to create holes and drive or remove screws from surfaces. These tools are perfect for people who are looking to complete their drilling tasks with ease. Since you will find multiple models in the market, you will need to consider the factors below to identify the impact driver that best fits your needs. This is the turning power of the tool as it drives into wood or other material. You want an impact driver that has a flawless performance, especially when driving screws or bolting. Torque is determined by a devices voltage with most models featuring 7.2V to 18V. This is an innovative feature included in the latest impact driver models. It allows you to reverse the rotating bolt or screw for correct placement. You can also use it to unscrew. You should consider how comfortable the handle of the impact driver is for work efficiency. The handle may be padded with foam or rubber. You want an impact driver that you can easily handle with one hand. Its body should be compact and lightweight to allow ease of operation. The best impact driver comes with a stable structure that is robust. This allows it to handle all loads with the required force. Ryobi p236 is compact and features a sleek design that is easy to handle. Even with the Lithium Ion battery, this impact driver is super light. It has a rubber handle whose shape offers a great grip for the average-sized handle. It has a better performance and comes with innovative features in comparison to the previous versions. Its speed is more reliable than the p236A. Ryobi p236 is an affordable drilling tool that homeowners can take advantage of. It is ideal for people looking for a cordless impact driver. • It features high torque. • It allows a quick bit changing since it requires no tools. • The battery and charger have to be bought separately. • The tri-beam only works when the driver is in its beast mode. • The LED lights will not stay on until you are done working. The chuck of this impact driver is auto-loading, which makes it fast. It has a ¼-inch auto-load quick coupler. The design is compact and lightweight, making it easy for one-hand handling. It weighs approximately 2.55 lbs. Ryobi p236 comes with 3 LED lights that illuminate the surface you are working on to obviate shadows. This allows optimum working ability and precision while drilling. You, therefore, can work with the impact driver even in low light conditions since you are able to watch the work surface. The motor features a torque of 1,600-inch-pounds that is powerful enough even for the toughest tasks. The torque is 40 percent higher than in other Ryobi models. This way, you can loosen and tighten the screws as you need. This power allows you to complete even the hardest jobs fast and efficiently. The torque, however, is preset, which makes it unpopular among users looking for more settings. 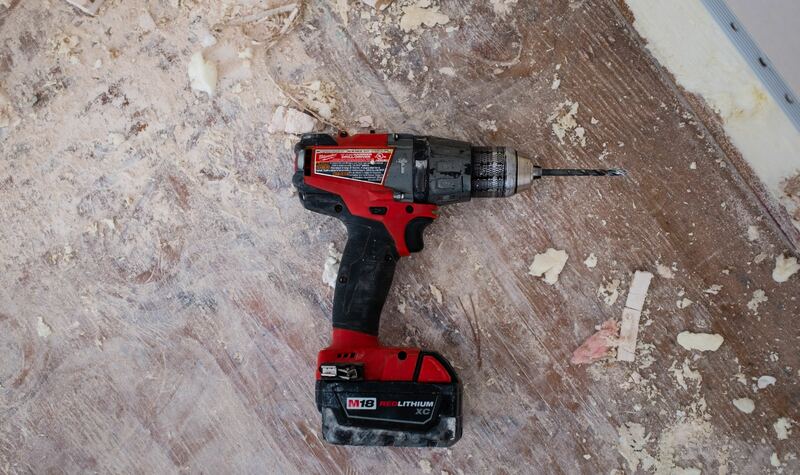 The impact driver has a voltage of 18 Volts, making it one of the most powerful in the market. Ryobi p236 comes with an extraordinary impact mechanism that gives you a chance of driving long screws. This means that you do not have to buy a hammer drill to use on 4-inch long screws. Lagging of bolts is also made simpler with the beast. Even when dealing with overhead pergolas, you need worry no more. This is because Ryobi p236 makes drilling easy and less tedious. Another unique feature is the MagTray magnetic holder. This makes it possible for you to place screws and bits accurately for drilling. Convenient for those looking to work fast and produce great results. You will also love the GripZone overmold because it makes gripping comfortable. Definitely a great improvement from previous models. The screw start-up is reliable with the Ryobi p236 impact driver because it features a variable speed trigger. This means that you can control the speed at which you can drill. The higher the speed applied, the more the trigger pressure. It should not bother you because it is a common feature with impact drivers. Its speed ranges are 3,200 Revolutions per Minute and 3,400 Impacts per Minute! Amazing, right? The variable trigger speed gives you an opportunity to optimize the maximum torque while managing the drilling depth and tension of the fastener. This allows you to make your fastening precise. When reviewing ryobi p236 vs p237, it becomes evident that using the p236 is easier. Ryobi p237 has a unit for adjusting the speed while Ryobi p236 is trigger activated. This way, you can change the speed depending on the pressure you apply on the trigger. Ryobi p236 features a direction rotation selector that you can use to switch between forward and reverse modes. For screw forwarding, the rotation selector should face left and right for reverse screwing. You can remove even the toughest screws from all surfaces. You will also love the onboard bit storage because it makes working convenient and less tiring. Like most other Ryobi tools, this cordless impact driver is powered by a Ryobi One+ range battery. Although you need to buy the charger and battery separately from the tool package, it is a relief to use the same items for a variety of tools. This battery system is preferred by environmentalists because by using it, manufacturers save resources. The pollution that occurs during the manufacturing process of chargers and batteries is also reduced. When charging, the system has indicators that show you how far low or high the state of the battery is. It takes about 1 hour to charge the battery fully. Once this is done, the impact driver will automatically stop charging. What’s more, the battery system is durable. The Lithium-ion battery maintains its charge for up to 24 hours depending on the work being done. This gives you ample time to complete your tasks. Ryobi p236 is cordless, which makes it ideal for working on a variety of stations. The corded impact drivers require you to be near a charging station for a power source, which might limit your operations. However, once you charge the Ryobi p236, you can carry it to work outside or somewhere else and take it for charging once it runs out of power. After purchasing it, you will get a Phillips Bit, a Socket Adaptor, and an Operators Manual. You will also enjoy the 3-year warranty on the impact driver. This is among the best impact drivers for people looking to carry out versatile drilling works. It is power-packed for efficient working and it has a brushless motor that is a reliable innovation. • DEWALT DCF887B can attain 3250 revolutions per minute and 3600 impacts per minute while Ryobi p236 has speeds of up to 3,200 revolutions per minute and 3,400 impacts per minute. • DEWALT DCF887B weighs 2.65 and is 20V impact driver while Ryobi p236 weighs approximately 2.55 lbs and is 18V. This impact driver comes with a high speed for efficiency in all drilling works. Like Ryobi p236, it is also powered by a lithium ion battery. Its speed is adjustable, implying that you can get more revolutions per minute without necessarily adjusting the torque. The housing is compact for ease of handling and durability. • The impact drivers are 18V. • Makita XDT111 weighs 3.9 pounds when the battery is installed while Ryobi p236 weighs 2.55 pounds. • These impact drivers come with a 3-year warranty. • The drivers feature a 1/4 inch hex chuck. • They are both cordless. • Makita XDT111 is designed with a torque of 1390-inch-pounds while Ryobi p236 comes with 1600-inch-pounds. • The impact drivers have the same voltage of 18V, which renders them powerful enough for any task. • The two come with a torque or 1600-inch-pounds that is highly reliable to work on all surfaces. • Milwaukee M18 weighs approximately 3.1 pounds making Ryobi p236, which weighs 2.55 pounds, lighter. Changing of a tire, drilling holes, and screwing are some of the activities that we have to deal with often. If you rely on an inefficient and unreliable tool like a drill hammer, it will make the work messy and take up more of your time. Hope the Ryobi p236 review helps you. The driver is lightweight and comes with a nice grip to facilitate one-hand use. It features tri-beam LED lights that help you view your work surface for precision. What more could you want in an impact driver? We hope that this ryobi impact driver review has been helpful!